Jean Allen Bissett, 69, of Windsor Locks, CT formerly of Colchester, CT, peacefully passed away Tuesday, July 8, 2014 at Kindred Healthcare in Windsor, CT. He was born in Sacramento, CA on March 4, 1945, son of the late Jean Clark Bissett and Glenna Mary (Curry) Bissett, and lived for a number of years in Fair Oaks, CA before moving to Connecticut. After graduation from Fair Oaks High School, Jean enlisted in the US Army and served during the Vietnam Conflict from 1963-1966. During his military service, he served as one of the original Delta Force Troopers from 1964-1966 and was awarded the Purple Heart, a Silver Star, Vietnam Gallantry Cross Medal, Special Operations Medal, and a Bronze Star. 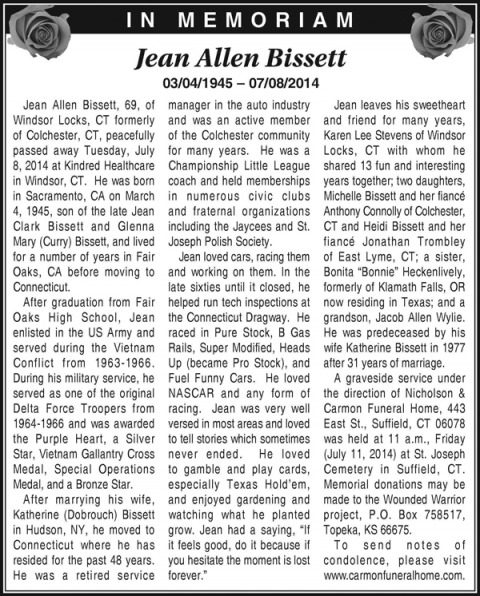 After marrying his wife, Katherine (Dobrouch) Bissett in Hudson, NY, he moved to Connecticut where he has resided for the past 48 years. He was a retired service manager in the auto industry and was an active member of the Colchester community for many years. He was a Championship Little League coach and held memberships in numerous civic clubs and fraternal organizations including the Jaycees and St. Joseph Polish Society. Jean leaves his sweetheart and friend for many years, Karen Lee Stevens of Windsor Locks, CT with whom he shared 13 fun and interesting years together; two daughters, Michelle Bissett and her fiancé Anthony Connolly of Colchester, CT and Heidi Bissett and her fiancé Jonathan Trombley of East Lyme, CT; a sister, Bonita “Bonnie” Heckenlively, formerly of Klamath Falls, OR now residing in Texas; and a grandson, Jacob Allen Wylie. He was predeceased by his wife Katherine Bissett in 1977 after 31 years of marriage. A graveside service under the direction of Nicholson & Carmon Funeral Home, 443 East St., Suffield, CT 06078 was held at 11 a.m., Friday (July 11, 2014) at St. Joseph Cemetery in Suffield, CT. Memorial donations may be made to the Wounded Warrior project, P.O. Box 758517, Topeka, KS 66675. To send notes of condolence, please visit www.carmonfuneralhome.com.